Having trouble getting your pistol rounds to go where you want them to? There are many factors that go into becoming a proficient handgun shooter. After perfecting (or, at least, moderately developing) core shooting principles like safety, stance, sight alignment and consistency it’s time to dial in other fundamentals like proper grip, trigger finger position, trigger pull/squeeze and work on consistency, proper breathing, not flinching, etc. 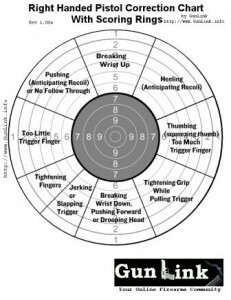 GunLink is here to help with free targets that you can download and print to help diagnose and remedy some common issues that pistol shooters face. Whether you are a pistol pro, a handgun hack or a revolver rookie, these targets are a great tool to troubleshoot your rounds right into the ten ring. Developed from data in the United States Army Marksmanship Training Unit Manual, the UIT (now ISSF) pistol book by John Chandler and the Target Pistol Shot Analysis documents from Target Shooting Canada, these targets are perfect for anyone wanting to improve or maintain their pistol shooting abilities. We have had good results using these targets to correct bad shooting practices and have got positive feedback from forum users who have tried them. These targets are not just for live fire practice, either. If you have a laser training tool or a laser sight that lets you see where your dry-fire “shots” go, these targets are a valuable resource. Print off a target, aim at the bullseye, and pay attention to where your laser beam goes. GunLink staff keeps at least one spare in our range bag for reference to compare to where shots impact when shooting any target. Download and print the targets below.